As a supplement, spirulina algae offers remarkable benefits for undernourished people, especially children. Over the past 40 years, numerous projects have been growing spirulina in developing world villages in Africa, Asia and South America. This is one example. The Integrated Village System in Farende, Togo. This remote village participated in an experimental project growing spirulina. Solar panels powered pond paddlewheels. A small 100 m2 pond could supplement the diet of 100 children a day. Pouring pond water through a screen, spirulina became a paste, then solar dried and distributed at the health clinic. Undernourished children took spirulina daily. One tbsp a day mixed with water brought remarkable results. 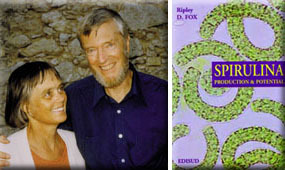 9:40 minute video of the appropriate tech project developed by Dr. Ripley D. Fox (1989). Tending the growing basin in Farende, Togo. Solar dryer in background. Dr. Ripley Fox and assistants harvesting spirulina through screens. The local health clinic nurse introduced children to spirulina. The design for the Integrated Health and Energy System won the prestigious 1987 European Award for Appropriate Environmental Technology, sponsored by the European Economic Community and the UN Environmental Program. Pioneer in village scale spirulina production to combat malnutrition since 1969. Developer of integrated systems for village spirulina production. Author of two books and numerous articles on spirulina. Experience in India, Togo, Vietnam, Peru, Senegal and China.